Call Center Simulation and IVR Simulator with Voice Broadcast Simulation and Auto Dialer and Predictive Dialer Simulation. Database Systems Corp. DSC has developed several simulation models to assist our clients when they are evaluating the purchase of call center equipment. To run these simulations, DSC requires certain information from our clients which we request using the contact form contained on this page. After receiving this information, a representative of DSC will perform the simulation and contact you with the results. The purpose of our simulator models is to estimate the resources required for various phone campaigns. This includes inbound IVR campaigns and outbound voice broadcasting projects as well as auto dialer and predictive dialer campaigns. To effectively run these simulations, the client must first provide certain information to the model. It is important that this information be as accurate as possible to obtain the best results from our simulation run. The following are the three different simulation models that we provide as well as the required information we need in order to run each type of model. Voice broadcasting and phone message broadcasting are industry terms for the process of employing a computer to call one or more phone numbers from a list and to deliver phone messages. Each call is analyzed by the computer for the type of respondent on the other end of the call. It could be a person, an answering machine, a busy signal, etc. The computer determines what to do with each type of respondent. For a person or answering machine, the computer could leave a message. For busy signals or no answers, the computer could schedule the call to be placed at a later time. Our voice broadcasting simulator model accepts numerous input parameters to simulate the more complex process of broadcasting phone messages to individuals and answering machines. There are two basic types of voice broadcasting campaigns - a simple Message Broadcast and a "Press Through". A "Press Through" campaign allows the call recipient to press a phone key to transfer the call to live agent for further communication. To simulate this type of campaign requires additional information about the phone configuration and voice broadcast program. Average Talk Time of "Press Throughs"
The simulation returns the projected run time length as well as voice broadcasting statistics. A sample of this report can be viewed on our Voice Broadcast Simulation web page. 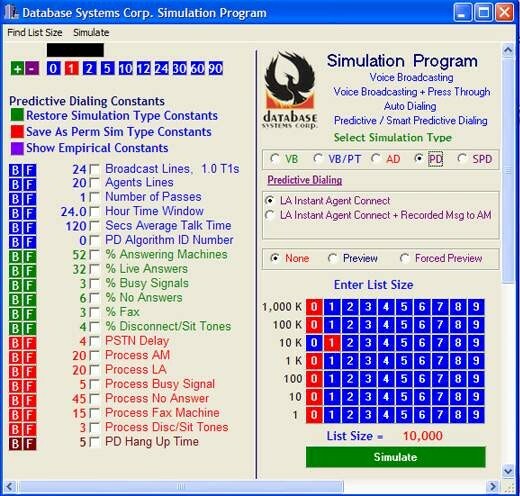 The predictive dialer simulator and auto dialer model simulates outbound phone calls placed by a predictive dialing phone system with answered calls being connected to live agents. Calls can be made predictively, i.e. calls made even when no agents are currently available, "predicting" that when a call finally reaches an individual, an agent will be available. An auto dialer only places calls when an agent is known to be available to handle the connected call. This dialer simulator model requires more detailed information such as talk time between the agent and the call recipient. The simulation returns the projected run time length as well as voice broadcasting statistics. A sample of this report can be viewed on our Predictive Dialer Simulation web page. Our IVR simulation model is a resource calculator. 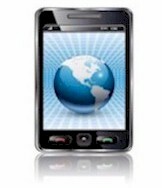 The IVR simulator model calculates resource requirements for an inbound phone campaign. It estimates the number of lines required to handle peak load processing of these calls. This model assumes that calls are evenly distributed during the peak period. Since the peak time can be simply defined in minutes, it is best to take the worst case call scenario in the shortest time period in order to calculate the resources required to handle your call volume. The information you provide is entered into our IVR Simulation model. The peak rate is calculated by taking the peak number of calls and dividing by the peak call time period to arrive at a peak calls per hour. The simulation returns the number of lines required to support your peak call volume and the number of T1's required. 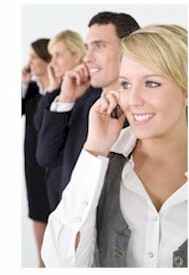 For a FREE analysis and simulation of your call center phone campaign, please complete the following form. Please indicate the preferred method of contact by providing either a phone number or valid email address. We will attempt to run your simulation as quickly as possible and provide you with the results by phone or by emailing the simulation output. Contact DSC to learn more about our call cente phone services and systems.